You are in for a treat but you have to do some work first. Start with cleaning the seeds out of the peppers. 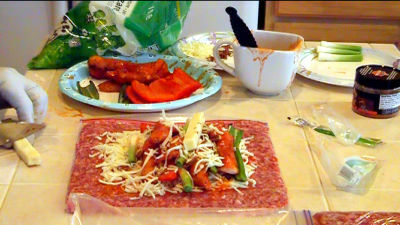 Slice the bell pepper into 3" slices. 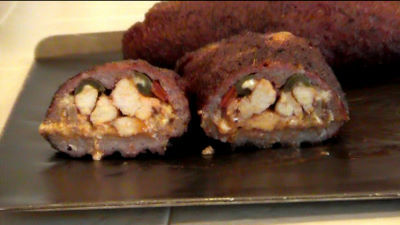 Slice the Jalapenos in half. Place these into the smoker @ 180 degrees. Clean and slice the chicken breasts into strips. Lightly season the strips with Jack's Old South Hickory rub. Once rubbed down, place the chicken into the smoker with the peppers. Cook until chicken has browned. While peppers are smoking. mix 3 lbs. of maple sausage with 2 cloves chopped garlic and 1 teaspoon McCormick's Smokey Maple seasoning. Mix well the divide the sausage in two. Form two balls and place each one into a 1 Gallon Ziploc bag. 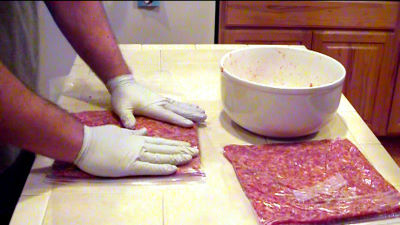 Press down and work the sausage to the sides and top of the bag. Release any air and zip shut. Continue until you have formed a symmetric flat sausage square. Do this to both sausage balls. Once the chicken and peppers are out of the smoker place them aside for now. Melt 2 tbsp butter in a bowl or cup. Add about 1/2 cup or less of Franks Red hot sauce and stir until mixed. Mop the chicken strips with the buffalo sauce (Frank's and butter). Close shut the seem and ends. Mop the top with the Buffalo sauce and then sprinkle on some Jack's Old South Hickory rub. Make sure you get it on the sides and bottom as well. Roll the Fatty's on to a baking sheet and transfer them to the grate in your smoker. Be careful not to rupture the outer sausage layer. You want to keep all the goodness inside. 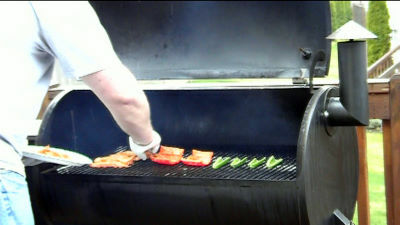 Smoke @ 230 degrees until the internal temperature is 175 degrees. This usually take 2.5 to 3 hours. Once the desired temperature has been reached, remove the fatty's from the smoker. Let then stand for 30 minutes. Slice and serve with a pan of cornbread or biscuits with real butter and hot raspberry jelly. Oh Yeah!